North Dakota is a breathtaking upper Midwestern state whose nickname, the Roughrider state, gives you a small hint as to the fantastic mountain biking opportunities this region has to offer. Bordered by Montana to the west, South Dakota to the south, Minnesota to the east and the Canadian provinces of Saskatchewan and Manitoba to the north, North Dakota is a virtually untamed northern state with miles upon miles of superb mountain biking trails. North Dakota is situated in the U.S. region known as the Great Plains, and represents the geographic middle of the North American continent. With an area of 70,762 square miles (183,273 km2), it is the 19th largest state in the union, but with a population of merely 750,000 residents (rank 47th) it is one of the least-densely populated states in the U.S.
North Dakota offers a variety of terrains to please the mountain biking crowd. The western half of the state consists of the hilly Great Plains, and the northern part of the Badlands to the west of the Missouri River. The state’s highest point, White Butte at 3,506 feet (1,069 m), and Theodore Roosevelt National Park are both located in the Badlands. The central region of North Dakota is divided into the Drift Prairie and the Missouri Plateau, while the eastern part of the state consists of the flat Red River Valley, the bottom of glacial Lake Agassiz. Collectively these terrains offer a wide variety of mountain biking opportunities that are guaranteed to please riders of all ages and ability levels. In the following article, we have showcased five of North Dakota’s most well-loved trails and provided a brief description outlining the unique characteristics of each of these fun-filled rides. Located in the town of Mandan, North Dakota, the Harmon Lake trail system consists of over 13 miles of beautiful riding terrain. The main trail at Harmon Lake is a 7.4 mile, moderately-trafficked loop course, one that winds through some of the most breathtaking fields of wild flowers in the state. The course, while rated moderate, is a fairly easy ride for all levels of riders. The trail is primarily used for mountain biking and is accessible from May until October. Dogs are also able to use this trail. The Harmon Lake trail system also includes a 4.2 mile loop on the west side of the Lake, which begins and ends at the main trail. Most of the riding at Harmon Lake is flat and scoots along on hard-packed terrain. There are a few obstacles that riders will need to face as they make their way along the course, including a few rock gardens, loose gravel, roots, and a series of jumps and berms. Riders will love the absolute beautiful views of Harmon Lake and the surrounding valley, consisting of beautiful bursts of color in every direction. 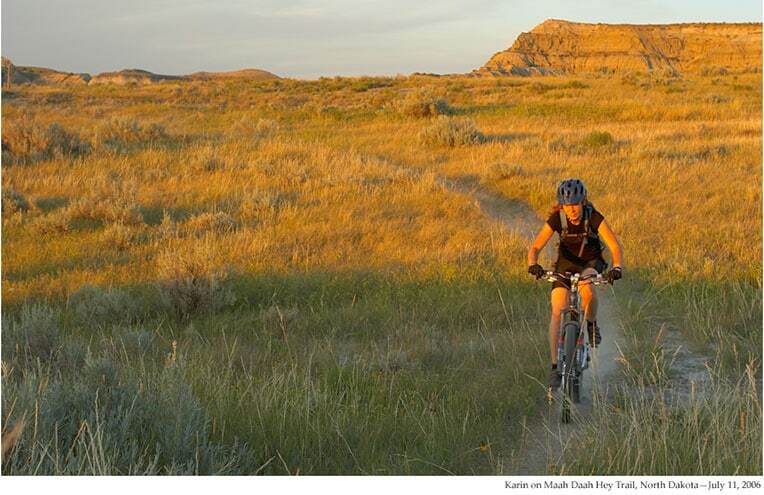 Situated in the town of Medora, North Dakota in the state’s Badlands region, the Maah Daah Hey Trail is an extremely popular 100+mile long distance course that is rated as intermediate in terms of its level of difficulty. The trail begins at Sully Creek State Park approximately five miles south of the historic town of Medora and meanders north through the south and north units of the well-loved Theodore Roosevelt National Park. Biking within the national park is not permitted, so riders will need to veer off onto the Buffalo Gap Trail as it runs along the park. The Maah Daah Hey Trail is jointly managed by the U.S. Forest Service, the National Park Service, and the North Dakota Parks and Recreation Department. The Maah Daah Hey trail system consists of eight distinct segments, each boasting some very unique topography and characteristics. There are (officially) six points of access along the Maah Daah Hey Trail, and ten great campgrounds (CCC, Summit, Bennett, Magpie, Elkhorn, Wannagan, Buffalo Gap, Sully Creek, Coal Creek, Burning Coal Vein), most of which have both RV access and running water. The Maah Daah Hey trail system showcases some of America’s most unique and awe-inspiring terrain. Along the way riders will be treated to a number of magnificent plateaus, jagged peaks and valleys, massive expanses of rolling prairie, and rushing rivers that interweave to offer every cyclist a true taste of the pure, untainted and untamed badlands. The Bison Plant Trail is located in the beautiful state of Minot, North Dakota. This 3.5 mile course consists primarily of tight singe track and is rated moderate (with tight trees) in terms of both difficulty and technicality. The Bison Plant Trail is comprised entirely of tight and twisty single track trail that loops through a beautiful section of wooded land that is owned and maintained by the city of Minot. Along the way riders will face some grueling climbs and thrilling descents, along with some very well-placed obstacles and technical features. Rocks, roots, jumps, bridges and berms are just a few of the great elements that make this course so fun to ride. The Bison Plant Trail offers excellent shade to cool riders off during the summer time, and varies from fast, hard-packed dirt cruising sections to tight technical zones that seem to constantly switch back through the tall trees. Its great location just outside of town makes it a great place for locals who wish to ride after work, and there is also a shorter variation of the trail used for running. To reach the Bison Plant Trail, follow Highway US 52 east from Minot about 2.5 miles past the Hwy 2 exit. The gate accessing the trail is normally open, but locals say it is best to park outside without blocking passage. Located in the small town of Sawyer, North Dakota, the Black Buttes Adventure Trail is a tight single track course rated for intermediate-level riders. The trail includes a few gentle climbs, lots of bumps and shakes, and a muddy water crossing. The Black Buttes Adventure Trail is a beautiful ride that traverses some breathtaking pasture land above a rushing river, and climbs over the Black Butte, which is easily the tallest of its kind for miles upon miles. As mentioned, the course consists of some tight single track terrain, with occasional rocky sections that can be fairly technical in nature. As it meanders, the trail circles the property following the elevation lines and switchbacks nicely up and back down the butte providing very nice views of the surrounding area. The main loop at Black Buttes measures roughly 5 miles in total distance, and there is also a 3-mile alternative trail that loops across the main course towards the southwest. Both of these trails sit on private property, so riders are urged to be very considerate when riding near the pasture animals. The Ice-Cave Trail is a 3-mile, beginner-rated mountain biking course located in the tiny town of Grassy Butte, North Dakota. This beautiful loop course is accessed via the Ice Caves Trailhead and heads toward the Magpie Campground via the aforementioned Maah Daah Hey (IMBA Epic) Trail. Made up entirely of single track terrain, the Ice Cave Trail includes some fun creek crossings that will almost surely leave riders a bit muddy—but it’s totally worth it. Once leaving the Maah Daah Hey, riders will dip into a majestic canyon that sits directly below the area’s large cliffs. Here they will be treated to some incredible ice caves, which only add to the overall beauty of the course. The Ice Cave Trail includes a few gentle climbs and pleasing descents, as well as some fun obstacles to negotiate, including rocks, roots, loose sand and side hill berms. The trail is not very technical in nature, but it is a perfect ride for a beginner or a nice ride to get in some training for the Maah Daah Hey 100. As you explore the cool, brisk air of the ice caves, be sure to watch out for rattlesnakes which, according to locals, are very prevalent in the area. There are also an abundance of antelope and deer in the area, as well as plenty of long-horned cattle.